Note: This post was written June 28, 2013. 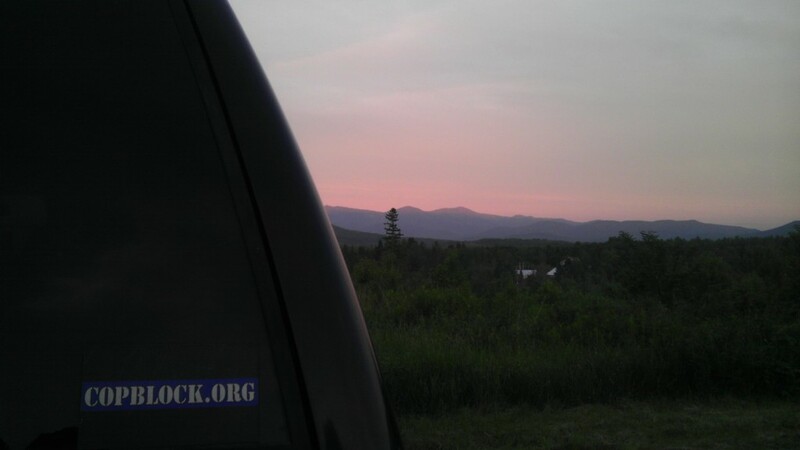 Last week lots of good synergy was had between those who trekked from around the globe to northern New Hampshire for the 10th annual Porcupine Freedom Festival, hosted by the Free State Project. 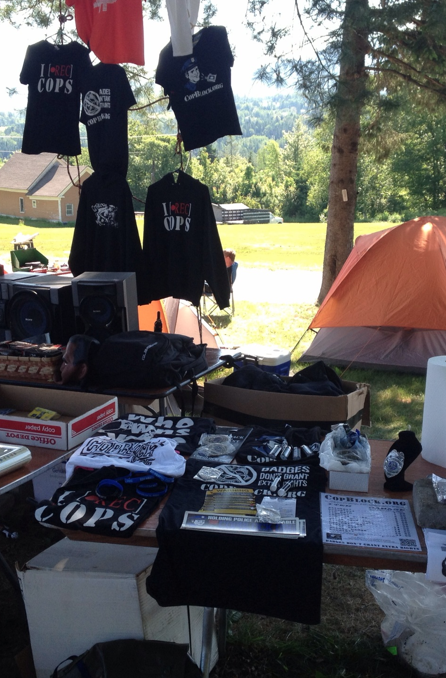 This was my seventh PorcFest – my motivation to be present can be summed up in one word: community. I often encourage Copblockers to connect with each other. 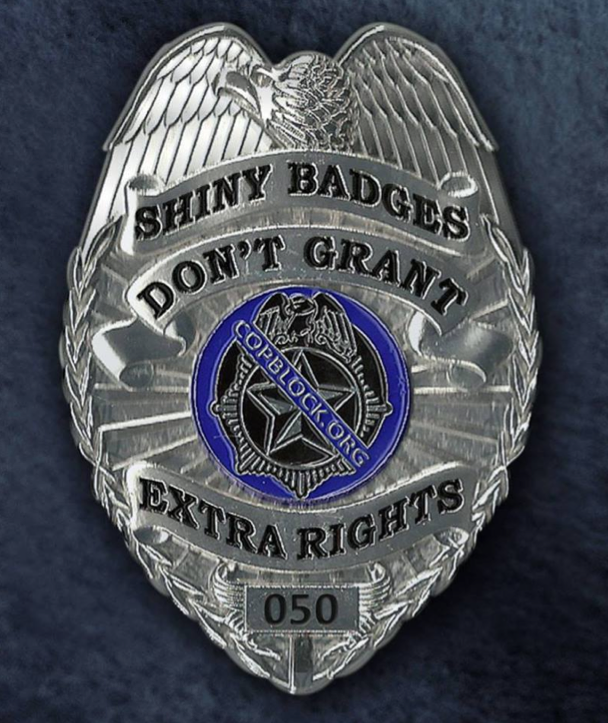 Being able to bounce ideas off others of like-mind, to collaborate where it makes sense, and to have a support system when needed, is necessary to bring-about the eventually demise of the current failed, coercive police institutions. When we each stop allowing ourselves to be led by the divisiveness peddled by those who claim authority, the sooner we’ll each conclude that we can live and interact via consensual interactions. 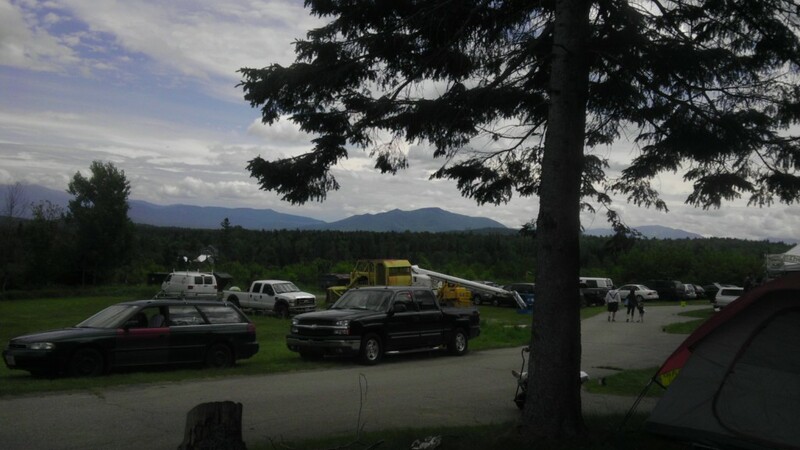 Such a perspective has permeated PorcFest, where 1,600 gathered. 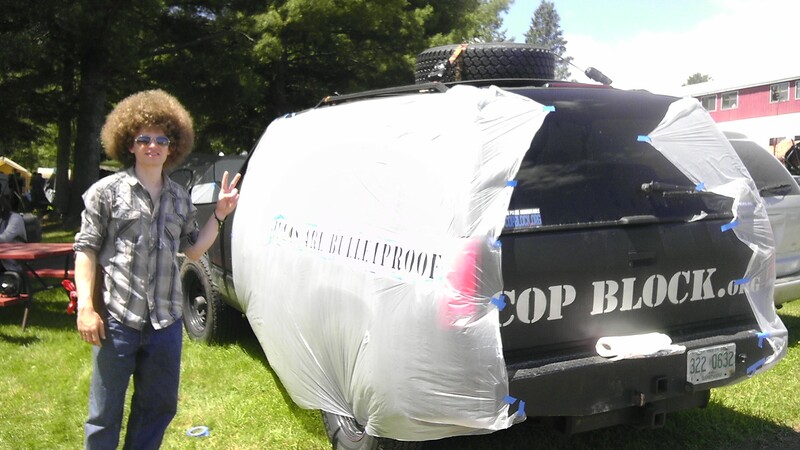 Monday morning I helped Kate Ager and Ademo Freeman set-up the Cop Block gear at the Laconia Free Market vendor area – which pretty much had the most-visible spot at Roger’s Campground, the venue where the Porcupine Freedom Fest was held. 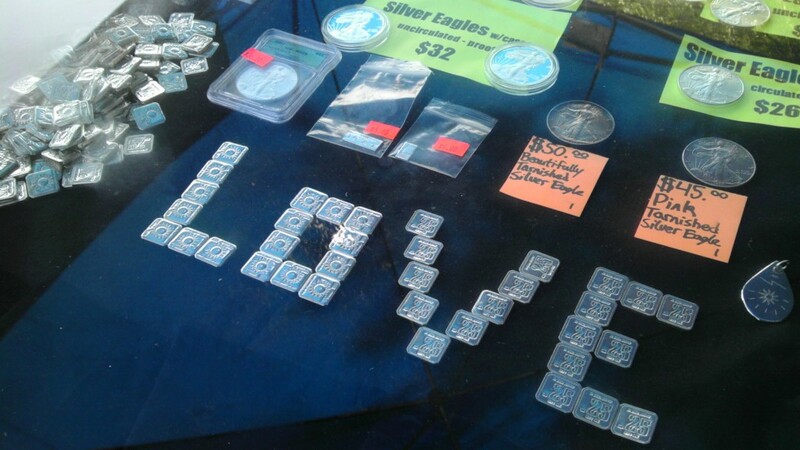 The item clearly in demand was the new Cop Block badge made by Davi Barker of Shiny Badges. The first batch – individually numbered from 001 – 100 – went fast. A second order of numbers 101-500 has been ordered and when received, will be added to Cop Block’s store. Note that #420 will be used for a raffle to raise coin for Rich Paul. 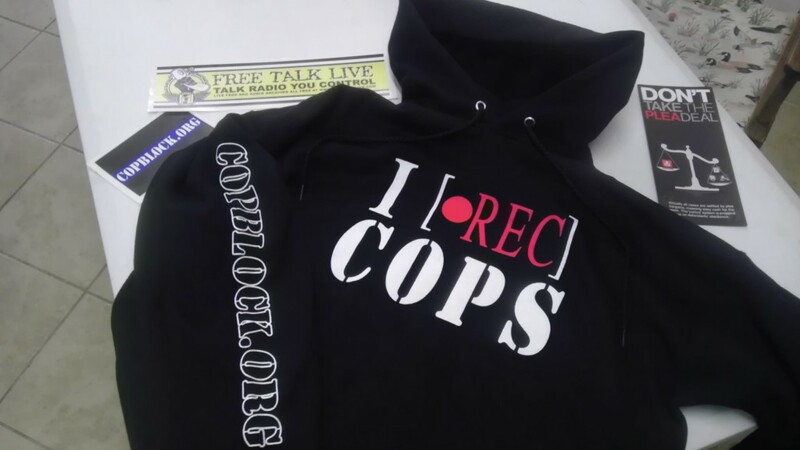 Also popular were Bic lighters with CopBlock.org and the tagline “Badges Don’t Grant Extra Rights”, as well as our new “I REC COPS” t-shirt/hoodie/girls shirt, which was originally designed by Marshall, a Copblocker in Utah. On Monday I joined others for a session entitled Exercise Your Body and Mind – just as it’s important to invest in yourself regarding your rights and how to best exercise them, I think it’s important to invest in your physical body. On Tuesday morning I joined John Bush on his radio show Rise Up Radio. Just prior to our segment Bush told his listening audience how 750 children in Polk County Florida had their irises scanned and cataloged by employees of Stanley Convergent Security Solutions, despite not gaining permission from the parents. 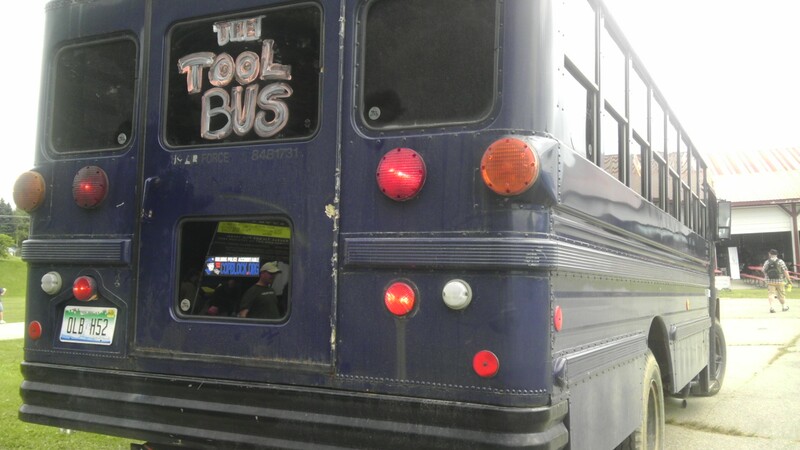 From a related story at UndergroundHealth.com: “Immediately upon discovering what had occurred, school officials both halted the pilot program amid a torrent of parental complaints and blamed their failure to notify parents ahead of time to a ‘clerical error. '” Are those the kind of folks you really want to leave your kids with? Later I caught Activism By Example with Ernie Hancock, who is among the best long-term visionaries I know of. 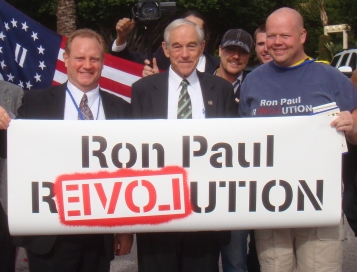 Some of y’all may be Ron Paul fans or at least familiar with who he is – Hancock was the person who created the sign pictured at right. 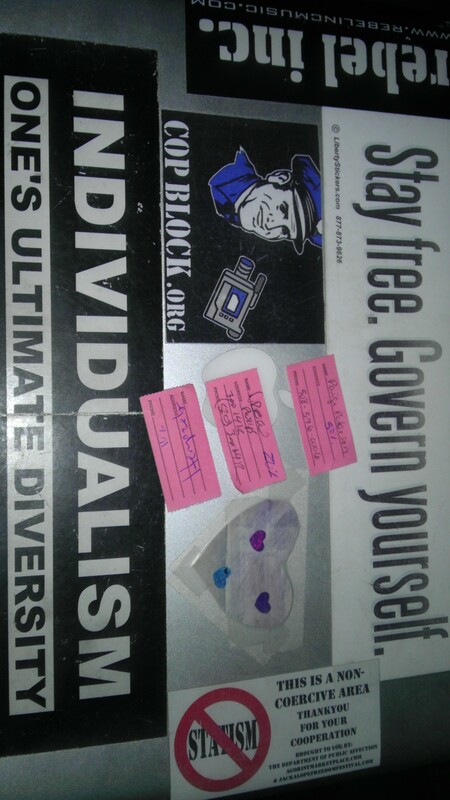 Some quotes from Hancock that I jotted down while present, from which you should be able to get the main thrust of his message: “Real community, real people, real support systems”, “You either own yourself or you don’t”, “Why are we paying attention to these people?”, “It’s not them we have to change it’s us”, “If you’re not having fun then you’re doing it wrong” Hancock also emphasized the enormous impact that can be had via humor and love. Stay abreast of Hancock’s activities over at Freedom’s Phoenix. That night I caught the movie Alongside Night, based on the book by the same name by J. Neil Schulman, which introduces into a reality not too unsimilar from that which exists today, a major agorism undercurrent. Note that a few years back Ademo and I met Schulman when in Vegas with the Motorhome Diaries. The goal of this panel discussion to empower each individual to act not constrained by fear, but according to their own conscience. 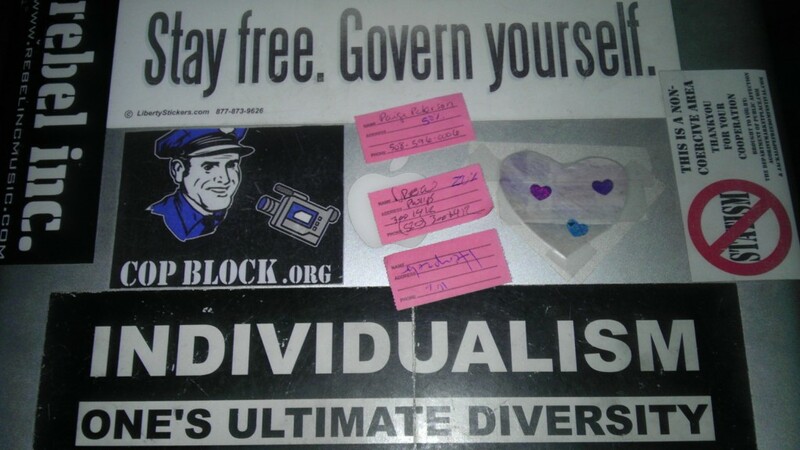 Covers the benefits of connecting with others for a support system, unpacking Statist Quo language (to more-accurately define things), practical steps for moving toward a life free from the intervention of some active in criminal organizations, etc. I thought it went well and we did receive good feedback afterwards. Once video from the sessions is made live it’ll be added here. 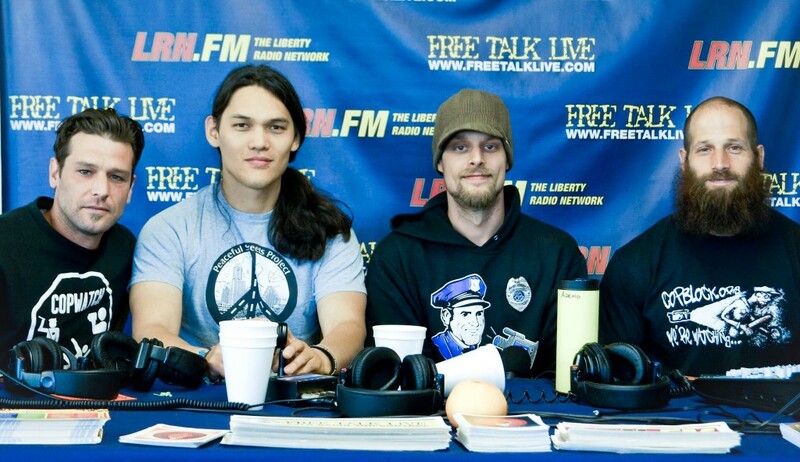 On Wednesday the two-hour panel session Eroding the Police State with myself and Ademo Freeman, Oakland-based Jacob Crawford, an on-point videographer who’s been active with police accountability movement for over a decade who can be found at WeCopwatch.org, and Austin-based Antonio Buehler, a stand-up, driven individual who’s efforts through PeacefulStreets.com have had a significant positive impact already. Though all-involved share a similar foundation, the panel format enabled our slightly different approaches to be teased-out. 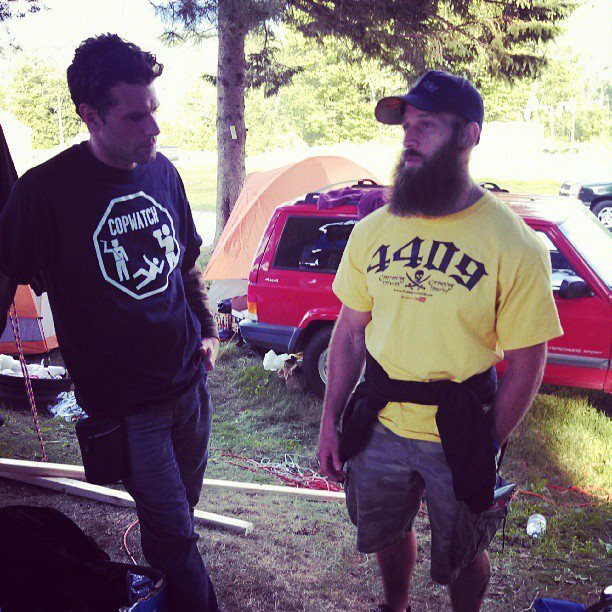 Needless to say, lots of good ideas were generated and continue to be discussed and implemented post-PorcFest. One scenario even has a couple of us visiting different cities later this year as part of a joint police accountability effort. Stay tuned! 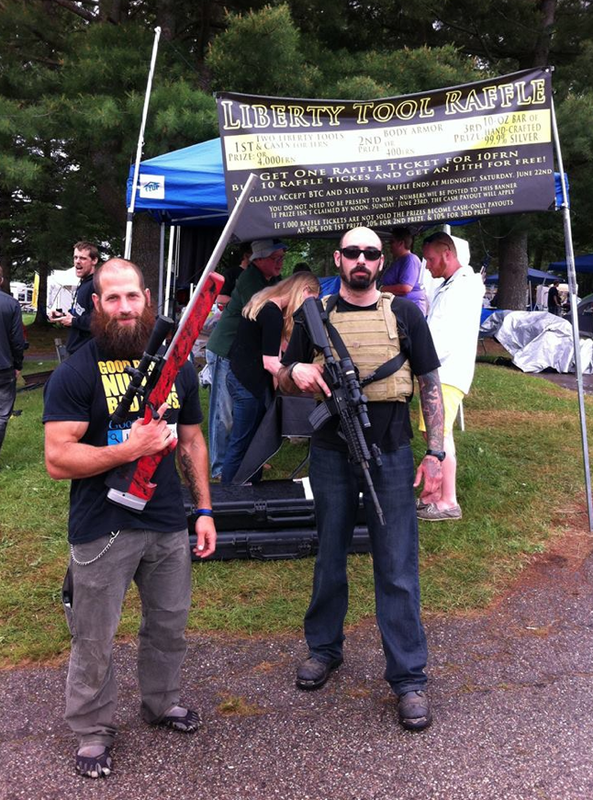 Garret Ean – of afro and Robin Hood infamy – gave me a hand making my rig a bit more of a billboard for liberty. 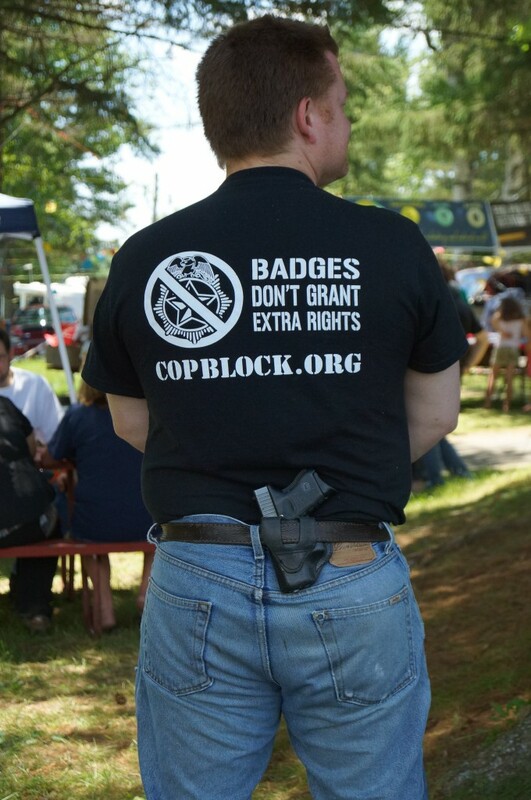 Later in the day, when David Friedman, author of The Machinery of Freedom strolled past, ,my friend Kevin asked him his thoughts on filming police employees, to which Friedman noted that he thought it was good thing. Just a reminder to make that the norm when you have any encounters – it’s better to have the footage and not need it than need it and not have captured it. Besides, filming most-often acts as a deterrent to predatory behavior. That afternoon and the next morning Jacob Crawford and I recorded interviews with Larken Rose, Ademo Freeman, Antonio Buehler, and Garret Ean. Those videos will be posted to CopBlock.org and added to this post in the very near future. On Friday morning some of us involved in further police accountability efforts met to further brainstorm strategies to potentially pursue to together have an even bigger impact. While no details have yet been nailed-down this may take the shape of a tour or some summit stops later this year. Stay tuned! And I was given a copy of the Silver Circle Movie (nice!) by producer Pasha Roberts. I caught the screening earlier this year in Nashua at Liberty Forum and I’ll definitely be sharing it with others in my sphere. They’ll be in Vegas July 10-13th. 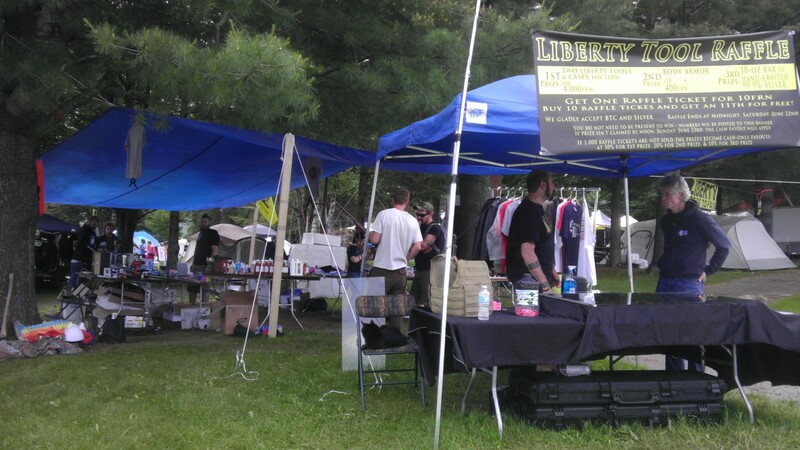 For a sizable chunk of PorcFest I was anchored, along with my bud Silver Dave, to a table for our Liberty Tool Raffle. Credit for the phrase “Liberty Tool” goes to Danny Riley, who referred to firearms using that lexicon in a letter he sent me from his Terre Haute cage. 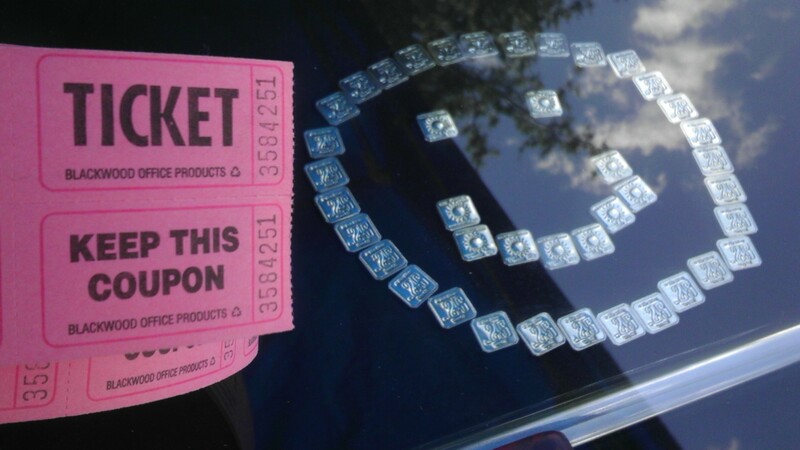 We had hoped to sell 1,000 raffle tickets but as we only moved 700 the raffle converted to a cash raffle, and winners received a percentage of the coin raised (at 50%, 20% and 10% levels). Despite the fact that our minimum wasn’t met, I was still happy with the outcome – all those who did receive winnings (Paige Peterson, Drew Phillips, and the Hempzels owner) are good people. Special thanks to Ademo and Liz Reitzig for helping to make those present aware of the raffle. Other sessions that looked of interest to me, that I plan to watch via video once posted, include: Central Planning vs Spontaneous Order by Ben Stone, Law in the Agora: Conflict Resolution in the Free Market by Steven J. Howard, Why Speak of Violence? by Larken Rose, Peaceful Streets Project with Antonio Buehler and John Bush, The Psychology of Authority by Michael Huemer, Art as a Tool for Activism by JC Vibes, The Chicago vs. Austrian School Debate by Matt Philips, David Friedman and Bob Murphy, Bitcoin: How to Subvert Your Government by Erik Voorhees, Vitalik Buterin, Ira Miller, Gabe Sukenik, and Roger Ver, Why Democracy Doesn’t Work by Mark Warden and Doug French. 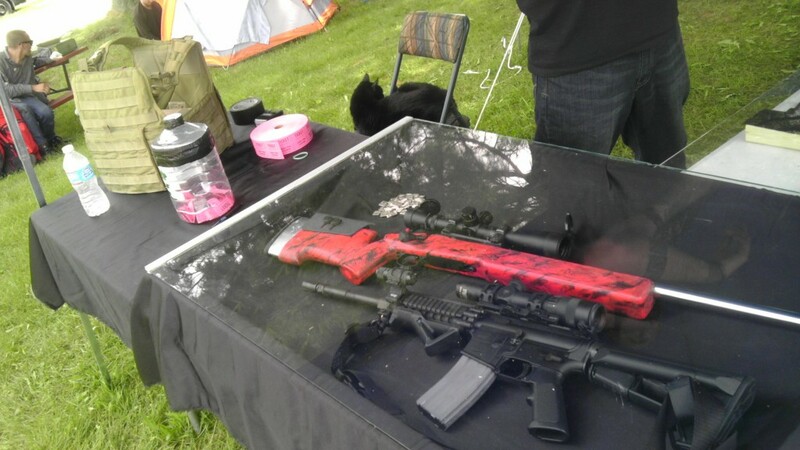 There were also a few self-defense-related sessions such as the Advanced Rifle Shoot led by Owen Martins and his team at Snake Hound Machines. 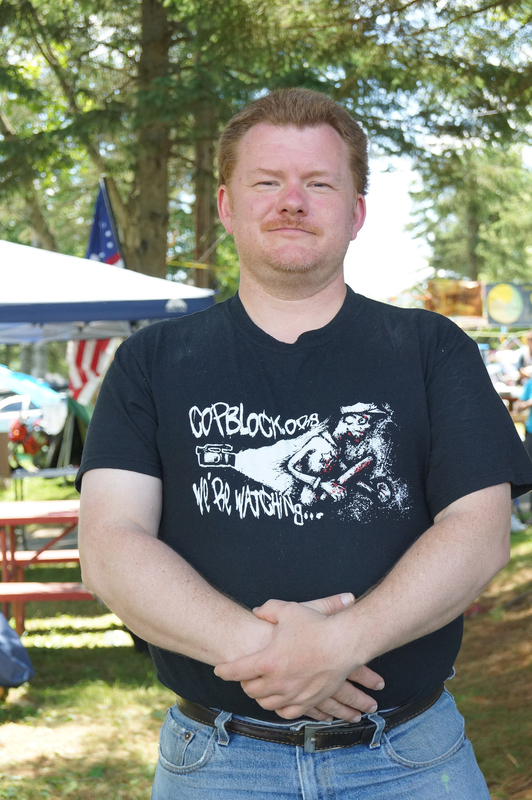 Also present at PorcFest were many other activists and doers, including Bill D., who’s behind the Green Beam Laser that’s been featured at CopBlock.org, Matt Bergman of PunkRockLibertarians.com and Lauryn Beth who just kicked-off Baltimore Cop Block, Ian Freeman & Mark Edge of Free Talk Live, Doug French of the Laissez Faire Club, the Bardo Farm, Healing Our World author Mary Ruwart, Tarrin Lupo, Amanda Billyrock, the Unschoolbus family, and many many more. Just think of the impact being had by all these doers! Especially after a week at PorcFest, which acts as a force multiplier. Sure, not everyone present chooses to focus on police accountability first and foremost (though there were definitely a lot of Copblockers present), but all these issues are inter-related. It’s of the same vibe, on the same premise – self-ownership. Needless to say there is obviously a lot we can do together and there are a lot of good people making that happen. Standing on the 2nd floor landing outside the media room (where http://FreeTalkLive.com & other shows air) looking over the field from left to right at the Freecoast Cabana, BitTent, Free Keene Pavilion]. This was taken in the later afternoon of Sun. 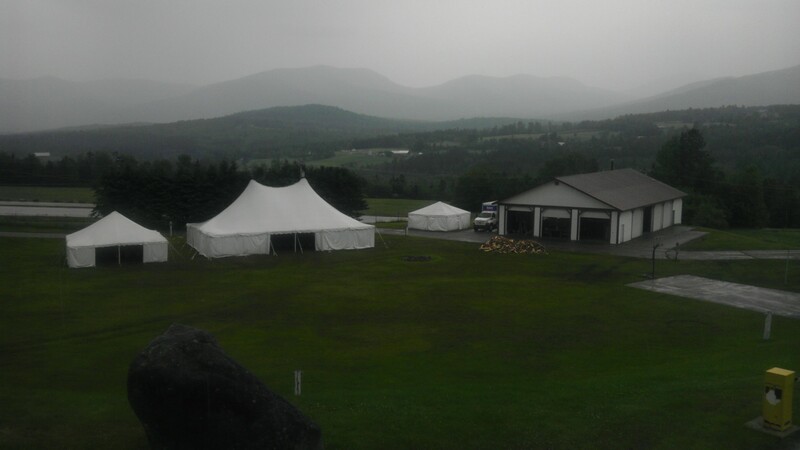 June 16th, before 99% of folks arrived for PorcFest. The first PorcFest for this 1996 6.5L turbo diesel Tahoe! 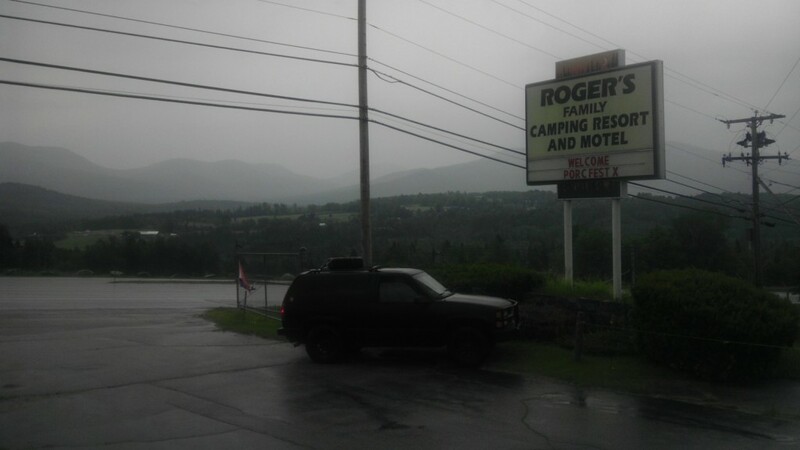 The White Mountains in the background. Beautiful in the ‘shire! More than a handful of individuals stayed up late to watch the sunset or sunrise. Lots of good convos and connections had.